Bishop Chatard students complete over 20,000 service hours per year. 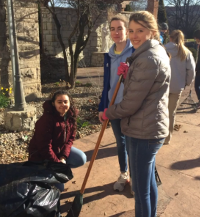 This is made possible through a robust service program that provides a list of service agencies and occasional service excursions that allows students to participate in service that fit their unique interests. The Bishop Chatard Campus Ministry Office tracks the number of service hours completed by each student. Students who go above and beyond their service goals are recognized at all-school assemblies. Service Hours need to be logged on MobileServe prior to May 1, 2019. Check the twitter above for some opportunities. Scroll down for more info. The goal of the Bishop Chatard Service Program is to foster the development of empathy, awareness, social responsibility and Christian community. Our mission sends us into every kind of work, reminding us once again that the further we go in giving, the more we stand to receive. Expose students to a variety of service opportunities so that they will discover their gifts and interests and remain committed to Christian service for life. Enable students to work directly with disadvantaged populations (outreach) and to have a deeper appreciation of the dignity of all human persons. Each month, at an all-school Mass, the St. Francis Assisi Award is presented to a student or staff member who is living out the mission of service. Nominations can be submitted to Carol Wagner, Campus Ministry Director, at cwagner@bishopchatard.org. Nomination form for the award. The St. Teresa of Calcutta Medallion is given to any student who has completed 75 hours or more of service during a given school year. This honor cord is worn at graduation, signifying a senior who has completed 200+ hours in their 4 years at Bishop Chatard. (Note: First students eligible for this award will be the members of the Class of 2018). On this day, the entire Bishop Chatard community – students, faculty and support staff – spend the day in service to others throughout the Indianapolis area. Many agencies, churches, and schools benefit from our work and look forward to having us back each year. 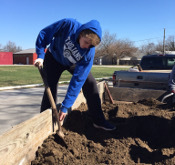 Community Service Day is Friday, March 22, 2019. Note: Community Service Day hours do not count toward individual student service hour requirements. The deadline to submit parent permission forms for Service Day has passed. Those students without forms will have the opportunity to serve the BCHS community in the school building on that day. All Service Hours need to be logged in to MobileServe prior to May 1, 2019. All service/outreach hours must be completed and documented no later than May 1, 2019. Senior essays must also be completed by May 1, 2019. To be documented, all service/outreach hour information must be submitted via our service app, MobileServe. Documentation must include the name of a contact person at the agency you served who can verify your service, or a BCHS staff member or coach who organized the service opportunity. Service/Outreach can be completed during the summer. If you are not able to access the online form, jot down details during the summer to be submitted in the Fall via the form. Open the MobileServe app and click on the “Activity” button on the left. If a submission has a green check on the right, it has been verified and accepted. If a submission has a red X, the student can open the page, edit as needed, and re-submit if needed. Failure to complete the required number of service/outreach hours will not impact GPA. However, it will result in the student earning an Incomplete, which will be recorded on the permanent record of the student, including report cards and cumulative final transcript. All outreach is service, but not all service is outreach. SERVICE is any type of work we do, outside of our normal responsibilities, to benefit others while receiving no pay or other benefit ourselves. Working with an approved agency to engage in person-to-person contact with the poor, the homeless, the marginalized, the institutionalized, elderly outside the family or any other socially or economically disadvantaged group. Sophomores, Juniors and Seniors service must include outreach hours as well as service hours.